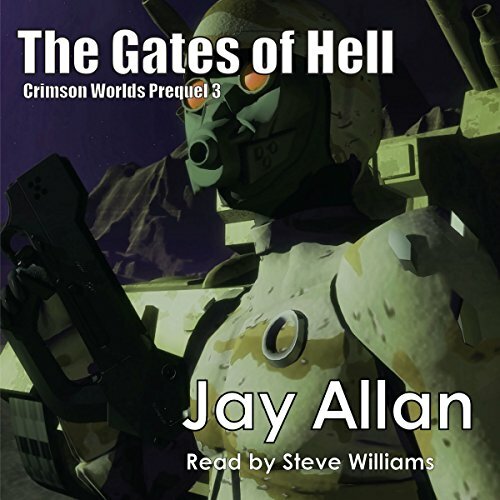 ©2014 Jay Allan Books, Inc. (P)2014 Jay Allan Books, Inc. I used to want to be a movie star. It really didn't take long in high school drama classes for me to realize that I was not an an actor. It was sad, but I moved on to something that I AM good at. Mr. Williams is faced with that decision now, before more time passes. His voice is not suitable for narrating. He mispronounces words like &amp;quot;proffered.&amp;quot; He has almost no ability at voice characterization. There is some inflection in the conversations, but too little. He needs another job. The painful narration makes it hard to tell if the story is good or not. The first hour (which is more than a third of the book) is boring and lacking in character development. It is hard to pay attention. About half way in, the tables are turned and the action heats up, but the narration is so bad that you can't cheer for the cavalry (twice), you can't mourn for the important deaths (twice), and the journal entry at the end is a cop-out wrap up that is supposed to thrill your Marine-loving heart, but ends up worse than a commencement speech. It might be more enjoyable in print, but probably not. How do you get through what appears to be a good story read poorly? I'm struggling here. I want to listen to the series but it isn't starting out well. People are getting blown up, giving their lives for their fellow marines, bargained away by corrupt leaders and all I could do was to keep slapping my cheeks to keep me awake. I know it's a good story because I'm mad as hell at the publisher for not casting it properly and ruining the experience. Sorry. I know this is cold. It just seems the publisher/producer/editor didn't give a damn about their reputation or the author's. I hope Mr. Allan can take more control of the presentation of his works. Action from start to finish. Read / listen to it. Thank you will find out what a great book it is let alone the entire series.